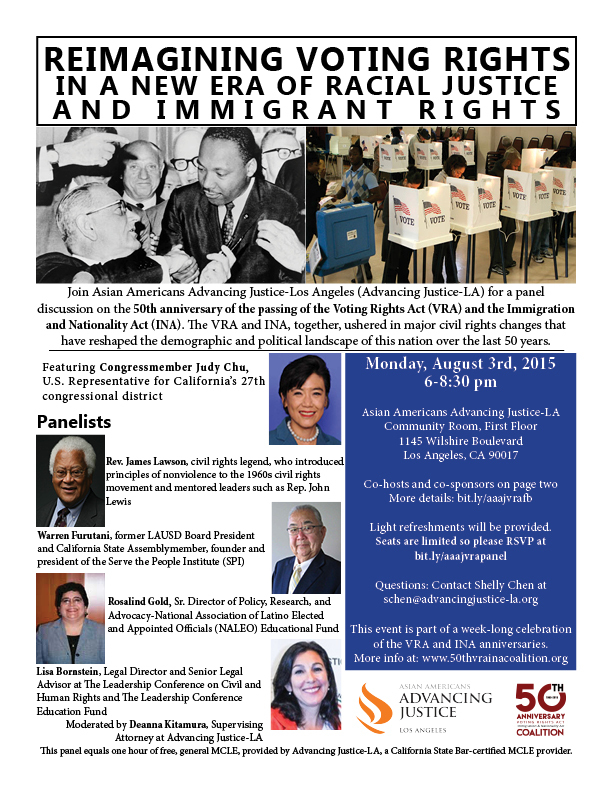 In commemoration of this year's 50th year anniversary of both the Voting Rights Act and the Immigration and Nationality Act, Advancing Justice-LA is hosting a special event on Monday, August 3, 2015, featuring Congressmember Judy Chu, legendary civil rights activist Rev. James Lawson as well as former state Assemblymember Warren Furutani, Rosalind Gold from NALEO, Lisa Bornstein from the Leadership Conference and Deanna Kitamura from Advancing Justice-LA. The event is FREE but online registration is requested: please RSVP via our Eventbrite page (http://bit.ly/1Ms9lJK). More details at our Facebook page (http://on.fb.me/1VHZAuQ), below, and on the attached flyer. Civil rights legend Reverend James Lawson, who introduced nonviolence principles to the 1960s civil rights movement, joins this panel to discuss the 50th anniversary of not only the Voting Rights Act (VRA), but also the Immigration and Nationality Act (INA), both passed by Congress in 1965. The VRA and INA, together, ushered in major civil rights changes that have reshaped the demographic and political landscape of this nation over the last 50 years. The VRA, passed on the heels of waves of violence against African Americans across the South, opened up access to the ballot box for African Americans and other communities of color. The INA eliminated long-standing racial quotas that until 1965 severely limited immigration from outside of Western Europe. The panel explores the VRA, the INA, the history of their passage and their legacies on modern civil rights and racial justice struggles in the context of current court and legislative restrictions on voting rights, as well as racially and ethnically motivated violence. • Moderated by Deanna Kitamura, Supervising Attorney-Asian Americans Advancing Justice-Los Angeles (Advancing Justice-LA). This event is part of a week of activities being planned by the Coalition for the 50th Anniversary VRA & INA Commemoration. Events run from August 1-9, 2015. For information on other events, check out the coalition website.